I will send an email the evening before the walk with information about cancellatioin due to severe weather (wet, heat, etc.). Most likely, I will reschedule the walk for another month and give each of you a "pass" that will allow you to join us on any one of the future walks. Our guides for the walk are Kathie and tom Brock owners who have devoted much of their adult lives to restoring and caring for this land. We will hear a little bit about their lives as they relate stories about their vision for the land and devotion to restoration work. The walk will climb a ridge, continue along the ridge for about 3/4 mile and then return down a trail the cuts across the slope. We will have options of riding a small off-road vehicle for those who could use an assist traveling both up and down the sloping trail. There are also trails at the base of the hill, following a stream as an alternative route. The views from atop the ridge are beautiful. The trails permit excellent views of the whole conservancy. The trails use in part mowed trails and the rest use the ridge-top service road and fire breaks. The walk will cover about 2 miles over rolling terrain (sometimes steep) and include a few stops as we hear about the various biomes and the life long work of Kathie and Tom to restore the land. Pleasant Valley Conservancy State Natural Area No. 551 is a 140 acre Preserve in western Dane County, Wisconsin. 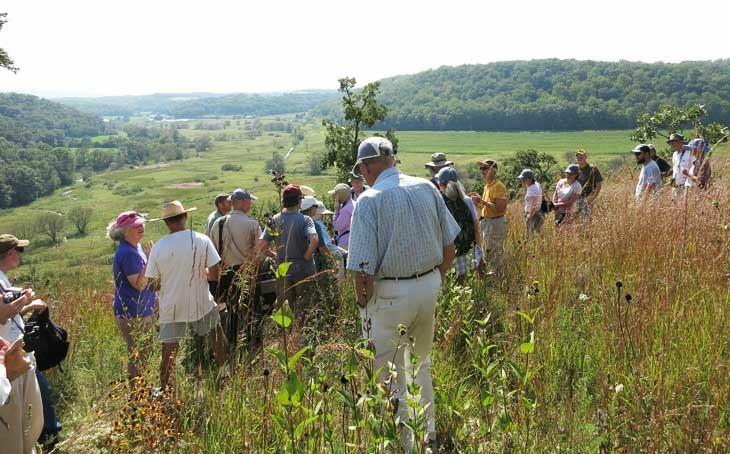 It consists of extensive restored oak savannas, dry, mesic, and wet prairies, wetlands, and oak woods. Scenic views and wildlife viewing are excellent, and several trails provide ready access to the Preserve. Especially noteworthy at Pleasant Valley are the fine restored oak savannas, once common in the Midwest but now very rare. The Preserve has many large open-grown white and bur oaks, which can be viewed from Pleasant Valley Road, and seen close up from the trails. The herbaceous layer in the savanna is highly diverse. The Preserve provides excellent habitat for cavity-nesting birds, including red-headed woodpeckers, a characteristic bird of oak savannas. Red-heads breed in the Preserve and can frequently be seen from the upper ridge trail. Breeding bird surveys have found around 70 species, including a number of rare and/or interesting species. Over 300 species of flowering plants have been recorded, including several rare ones. Purple milkweed, a species endangered in Wisconsin, is found extensively in the savanna areas and is thriving. Other plant species found here that are threatened or of special concern include: upland boneset, cream gentian, glade mallow, yellow giant hyssop, prairie turnip, and sweet Indian plantain. Pleasant Valley Conservancy is a site of The Prairie Enthusiasts (TPE), an organization active in the upper Midwest. Part of the Conservancy is owned by TPE and the rest is permanently protected by a conservation easement donated to TPE by Kathie and Tom Brock. A google map is provided starting downtown Madison. Change the starting address to tailor the driving instructions. Questions? Contact Mike Di Iorio @ mdiiorio1234@gmail.com or 608 520 4448.